LOUISE LYKES was a very old lady when I took this photo in Tilbury. She was a WWII built American ship of the standard type. Owned by Lykes Lines. RWJ, if this is any help the CHARLES LYKES was on the same set of negatives as the JAPAN LILAC on the Tilbury repair jetty. 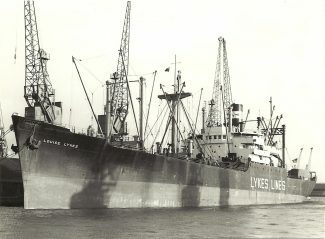 The LOUISE LYKES was on the set of negatives when the AMERICAN LEGION arrived in Tilbury, possible 1967/68. Very unusual to see Lykes Lines (of New Orleans) ships anywhere in the port of London prior to the introduction of the three large barge carriers, which moored in Gravesend Reach opposite Tilbury, from 1972. This, and another that you photographed, CHARLES LYKES, I missed completely (that is, I did not see them when in Tilbury). Can you give a guestimate of when you photographed them? I would think 1968-70, with the possibility of both of them in February 1970 (they were both “in Europe” then) or CHARLES LYKES possibly December 1968 (was in Europe then).